When is a closet not a closet? When it’s a linen closet. Chances are yours is actually a catch-all cabinet stuffed with lots of things that aren’t made of linen. The problem is that most linen closets are ill-designed for storing so-called “linens,” the time-honored name for the household goods category that includes bedding, towels and tablecloths. One of the most common linen closet flaws is too-deep shelf space that makes it awkward to access items stored in back. This “backed-up” area tends to get clogged with forgotten miscellany hidden behind towers of towels and stacks of sheets. Those towers and stacks can grow precariously high, thanks to another common design flaw: shelves that have too much space between them. Keeping those teetering piles from toppling is usually futile, especially in a hectic household. If your linen closet is due for an overhaul, first weed out space-wasting “excessities” (excess necessities). Your goal: Donate, discard, recycle or repurpose whatever doesn’t need to live in your linen closet. Reduce redundancy by streamlining your shelf-busting stash of extra bedding. Two sets of sheets and pillowcases per bed are generally sufficient; free up precious shelf space by clearing out extras that you don’t really use, along with superfluous blankets, comforters and bedspreads. Ditto for ready-to-retire towels, washed-out washcloths and any other linen closet contents you’re ready to part with. Let go of items that have outlived their usefulness along with those that were never really useful to begin with (think fussy guest towels and too-pretty-to-use gift soaps). The next step involves setting up systems to keep your linen closet shelves organized and uncluttered. Fortunately, there’s now a wide range of efficient and affordable storage solutions to help you divide and conquer this challenging space. Several types of shelf dividers and organizers are ideal for linen closet use. • Among the best is the line of Collapsible Linen Storage units from Kangaroom Storage (www.kangaroomstorage.com; $13-$17), sized specifically for folded linens. The small unit holds washcloths, hand towels and pillow cases; the medium holder stores bath towels and sheets; and the largest size works for blankets, covers or pillows. Cleverly constructed of canvas-covered panels designed to fold up and store flat when not in use, each unit features a label holder and includes a sheet of preprinted labels for instant organization. • Vertical Chromed Shelf Dividers also can keep foot-high stacks of folded linens upright and prevent them from migrating (www.improvementscatalog.com; $13, set of four). They slip over the front edge of up to 1-inch-thick shelves and are easily removable. 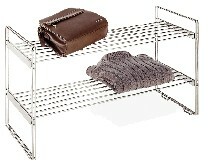 • To utilize wasted space between shelves that are too far apart, a good option is modular ventilated Chrome Stackable Shelving (www.onlineorganizing.com; $32). This type of shelving is ideal for linen storage because the grid design allows air circulation, and unlike similar shelves made of plastic or particle board, the chromed steel won’t end up sagging under the weight of stacked linens. • Another ventilated solution for maximizing those between-shelf gaps is under-shelf Slide-On Baskets, available in two sizes (www.plowhearth.com; $10-$12). Made of white powder-coated wire, they’re designed to slip onto shelves and also partially slide out for easy access to contents. • Completely converting your existing shelves to slide-outs is a more costly yet extremely efficient way to make your linen closet contents fully accessible (thereby eliminating the “clutter cave” effect). Prices vary depending on shelf dimensions and the type of materials used. There are several companies that specialize in “roll-out shelf conversion,” including the San Diego-based Shelves to Drawers (www.shelvestodrawers.com). They offer do-it-yourself options as well as professional installation. • An inexpensive way to supplement your shelves is by attaching a towel bar to the inside of your linen closet door for hanging long, hard-to-fold items such as sheet sets, tablecloths and oversize bath or beach towels. A basic rule of organization is to store items close to where they are used. So if your linen closet isn’t located right by bed and bath areas, setting up alternative storage systems could help your household run more smoothly. Back when most houses lacked closets, wooden chests were used to store sheets, blankets, tablecloths and towels. You can update this idea by using a storage bench at the foot of your bed for keeping bedding handy (plus a place to sit, at no extra charge). HomeVisions has a variety of reasonably priced versions, including several cedar chests (www.homevisions.com; $129 and up). The linen Source carries a good selection of upholstered storage benches (www.linensource.com; $249-$399) and also offers custom upholstery. Other linen closet alternatives include bureau drawers (you can convert an old dresser for this purpose) and under-bed rollout chests. The clear, wheeled Slimfit Underbed Storage Box from Linens ’n Things has dual openings so you can access stored linens from either side of the bed (www.lnt.com; $18).